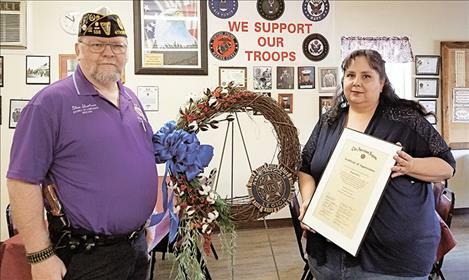 So, a lot of heart went into making the wreath, which was placed at the wall on behalf of The American Legion by Commander Mike Shepard of Columbia Falls Post No. 72 and District No. 4 Commander Glen Sharbono of Ronan. To show the grateful appreciation of the whole district and himself, Commander Sharbono had all the Commanders, or a representative of each Post within the District, sign the certificate. It took some time to acquire all the signatures. The certificate is signed by 12 Post officers in addition to the District Commander and Mike Shepard.